:Ever try to prepare a new meal without using the recipe? You may have all the cooking utensils, but without directions and the proper measurements, you could create a giant mess! Preparing young men for manhood is no different. They need guidance, and to be instilled with the right "ingredients" to become men whose lives will honor their friends, families, and God. 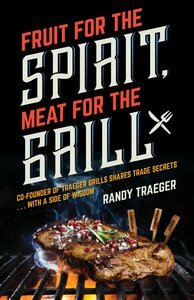 In Fruit for the Spirit, Food for the Grill, author and football coach Randy Traeger serves up sage advice for how men can be better husbands, fathers, co-workers, and friends, as well as leaders in their communities. Randy shares stories and practical steps toward adopting integrity, patience, kindness, honesty, self-discipline, and more. As co-founder of the popular Traeger Woodfire Grills, Randy not only shares his best lessons for character development, he also shares his best barbecue recipes. Learn how to prepare mouth-watering, savory meat dishes, including beef brisket, prime rib, smoked teriyaki, and spare ribs. Don't be a half-baked man, missing a few ingredients! Join Randy, and thousands of others who've followed his example, in pursuing a virtuous lifestyle... becoming better men at life and at the grill! About "Fruit For the Spirit, Meat For the Grill"